I only arrived yesterday (yes, the day that a helicopter crashed in Central London! ), but it feels like I've been here for years! It's different to enter a city for business purposes or just for travel. I haven't seen much of London yet, and feel a bit guilty when I walk by the museums, churches, galleries and shops. But I just simply don't have time for that. Why am I here? To meet people! I probably scheduled too many meetings in a day, but it all works out well. I want to start talking about three power ladies who all deserve a mentioning. Sandra Anido, general manager of a five-star Hilton Hotel The Bentley in the heart of Kensington. Sandra is Dutch and lives in London since 1998 as she fell in love with an Albanian boy and decided to stay. She started working as a receptionist of a hotel and now is general manager. Then the Dutch-Turkish student Derya Yilmaz. We met through twitter, as she is a fan of Texas, she started following me on Twitter. Two years ago she studied International Business and Marketing in San Antonio, then returned to Holland but would do anything to get back to Texas. And in the meantime she decided to get her master's degree at a University in London. Tonight I am invited to a reception hosted by Member of the Parliament Nick De Bois in the House of Commons,an event organised by the Centre for Turkey Studies and the International Forum for Democracy and Peace (IFDP). The keynote speaker is Tuna Bekleviç, Founder and President of IFDP. The nice thing is that Tuna and I are both alumnis of the International Leadership Visitors Program. (The US State Department connects through IVLP current and emerging foreign leaders with their American counterparts through short-term programs). I see that it's almost 6 pm, I am already running late. So, no, except for the fact that I am sleeping in a hotel, I don't feel like a visitor at all! I am really looking forward to meet more active Londoners and internationalists! Today I am going to meet Austin Bay, author of 'Atatürk: Lessons in Leadership from the Greatest General of the Ottoman Empire'. A very readable book that surveys Atatürk’s military career. Austin Bay lives here in Austin. He is a syndicated columnist, professor, developmental aid advocate, radio commentator, retired reserve soldier...and a war game designer (he consulted in wargaming at the Pentagon). He holds the rank of Colonel, in the U.S. Army Reserve. As a Kemalist myself, and following the recent developments in Turkey intensively, I am very curious what drove a retired US Colonel to write this book. 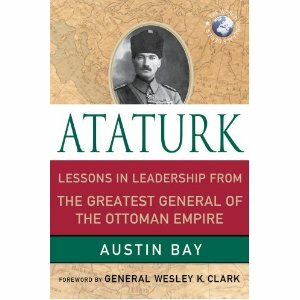 Bay acknowledges Atatürk being a military genius. Atatürk's achievements have always been acknowledged. In 1997, Time Magazine called Atatürk Person of the Century and McLaughlin Group declared in 2000 that the award for "the Person of the Full Millenium goes to Mustafa Kemal Atatürk". 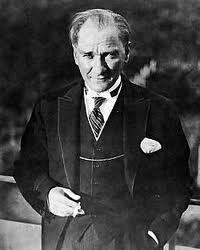 I have read many books and articles saying Atatürk being a genius, both as a military leader but also as a statesman. But in Austin Bay's book I found what exactly is meant by genius, explained by Prussian general and strategic theorist Carl von Clausewitz. By "genius" Clausewitz meant "a very highly developed mental aptitude for a particular occupation". Surveying "those gifts of mind and temperament that in combination bear on military activity," he emphasized that courage "in the face of personal danger, and courage to accept responsibility" are required. "The highest kind of courage is a compound" of "indifference to danger" and positive motives as ambition, patriotism, and enthusiasm." Clausewitz believed that war requires intellect of a special type, for "during an operation decisions have usually to be made of a special type, for "during an operation decisions have usually to be made at once; there may be no time to review a situation or even to think it through." For the combat leader, "if the mind is to emerge unscathed from this relentless struggle with the unforeseen, two qualities are indispensable: first, an intellect, that even in the darkest hour, retains some glimmerings of the inner light which leads to truth; and second, the courage to follow this faint light wherever it may lead. The first of these qualities is described by the French term, coup d'oeil; the second is determination." Clausewitz's coup d'oeil referred to both the "physical" and "inward eye," but, "stripped of metaphor,...the concept merely refers to the quick recognition of a truth that the mind would ordinarily miss or would perceive only after long study and reflection." In Clausewitz's other words: it really is the commander's coup d'œil, his ability to see simply, and at a glance, the possibilities offered by the terrain. I have a new hero! Tehmina Durrani. 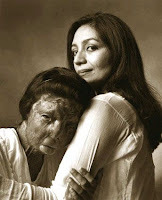 The woman who took care of Fakhra Yunas, the Pakistani victim of an acid attack. Fakhra committed suicide a couple days ago. But Durrani arranged to take her abroad, capturing media attention for acid attacks in Pakistan. Normally I don't post pictures on my blog but look at this beautiful picture of two women, how they support each other, probably knowing that it could have been either of them. It can happen to any of us. Maybe not the acid attacks, but all sorts of violence against women. It makes me hate societies in which these things happen. And I just can't understand how people, men or women, can sleep while this is happening. Here is the link to Tehmina's full biography, I insist you read it. Fighting basic women's health issues in 2012? Seriously? What the heck is happening with this country?! Who knew that in 2012 in the USA politicians would be fighting about contraception and basic women's health? Tomorrow I am attending a great idea from my friend Sarah Bird and Marcia Ball. It started last week, but tomorrow and following Tuesday, between noon and 2:00 PM, everybody is putting on a red shirt and stand in front of the Texas State Capitol at the corner of Congress Avenue and 11th Street holding a sign decrying the defunding of women’s health services. The calling is named SEEING RED and it may be just a few women with a few friends or a few hundred. No keynote speakers. No podium. No PA. Just red shirts and signs. Spread the word. By the way, this is not a “women’s movement”, so come on, come all! I was invited to a reception hosted by Global Austin for the IVLP's from Libya. At this citizen diplomacy reception I met six distinguished visitors from Libya. These emerging leaders were selected by the U.S. State Department to visit communities in the U.S. for professional appointments and community hospitality. They are members of Libya’s National Development Board (EDB), assigned the task of creating a system to address the needs of veterans. The focus of their program is on the roles and responsibilities of governments, the private sector, and local communities that provide benefits and services to war victims and veterans. Although almost all the six leaders (average age I guess not older than 30) could speak very well English, I was glad that they were hosted by professional interpreters. With such a heavy issue (victims of war) on the agenda, you better really understand what people are talking about and more important: what they need. As we all know, Libya just got rid of their dictator Khadaffi who ruled coldbloodedly over the country for 40 years. When I speak with these Libyan representatives, one thing is really obvious to me: they are young, ambitious but also 'seeking' their way how to develop their country. The projectmanager of the Economic Development Board that I spoke a long time with, told me that more than 50,000 people got killed. Maybe that doesn't sound much (I mean in wartime), but Libya only counts a population of 6 million, so then it's a lot. What struck me most of his story was that next to the killings, more than 8,000 women were raped. For Libyans and most Arabs (but I think for many people around the world), this has had more impact than the killings. Khadaffi knew that Libyans could accept it easier to have their sons killed than their daughters raped. He used this psychological terror, and up until now, more than 8,000 women stay at homes, isolated, far from the society, and with no help. They are scarved for the rest of their lives. When asked the delegation what they needed most, their answer was: support. Whether it's moral, mental, professional or financial, they said it's good to know that we don't have to do this alone. I was asked personally to keep on writing on Libya and the developments concerning the Arab revolution. Well, that's the least I can do. In the meantime it is my intention to find out whether there is some kind of program being developed to help the 8,000 raped women. I will contact the Art of Living Foundation (a humanitarian NGO engaged in stressmanagement and service initiative) to ask whether they have already started a program in Libya. Maybe you think: it all happens somewhere far, somewhere you don't know anything about, except for the images that you've seen on tv and read in newspapers). But I will never forget what my mother once said while we were watching disasters on the news: 'It's happening to them, but it could've been us.' When I look at it that way, I feel more connected to my Libyan sisters than ever. Malice? No. Ignorance? Undoubtedly. Dutch journalism in general is in a poor state. (In addition to the slurs in the title and text, the writer also called the Barbados-born singer Jamaican.) But it is also increasingly out of touch, a bastion of white Europeans covering a multicultural country. The large cities in the Netherlands are already more than half non-native Dutch, but you’d never know it from the media. A journalist of Turkish decent who grew up in the Netherlands, I started researching the lack of diversity among the Dutch media 20 years ago, and even today many consulting firms make lots of money telling media companies how homogenous they are. Eventually I founded a glossy magazine for young Mediterranean women, because they went completely ignored otherwise. At the same time, there is a certain arrogance to Dutch journalists; they just write any article as they see fit, taking little care toward their representation of other cultures. The truth is that if the staff of Jackie included just one person of color, the editor would probably still have a job. Working in a multicultural environment—the real world, in other words—would have taught her not to use, let along publish, that type of language. But it was Rihanna who truly made this moment into a dialogue. I find her words deeply gratifying, all the more so because, in the age of Twitter, she could broadcast them so publicly. This way the whole world can assess what has happened to the Netherlands, once a cradle of tolerance, liberty and enlightenment. Imagine what the media looks like to the ethnically non-Dutch living in the Netherlands. There are nothing but blue-eyed blonds on the covers of magazines and catalogues. Same with the cast of the popular local version of ‘Jersey Shore,’ called ‘Oh Oh Cherso’. On the game show “I Love Holland,” host Linda de Mol quizzes guests about Dutch history and cultural trivia. Meanwhile, if there were elections now, Geert Wilders’ right-wing blatantly anti-immigrant party would be the second biggest party of the Netherlands. Aided and abetted by its TV producers and magazine editors, the nation is retreating into a bubble that is offensive and outdated. And, as Rihanna proved, destined to blow up in their face.